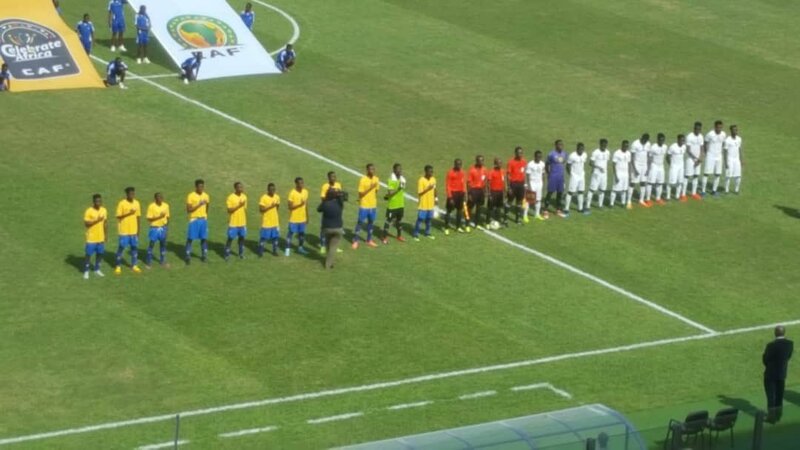 Ghana’s U-23 beat their Gabonese counterparts 4-0 in the first leg of th last round qualifiers for the 2019 CAF U-23 Afcon in Egypt. A second half brace from striker Osman Bukari made sure of the convincing victory after Kwabena Owusu and Bernard Tekpetey had given Ibrahim Tanko’s side a 2-0 lead. But the game did not start brightly for the Meteors.Terrible defender from Musah Nuhu, allowed Gabon striker Babicka Shavy through but goalkeeper Kwame Baah pulled off in incredible double save to keep Ghana in the game. On the end, Ghana were threatening. Striker Kwabena Owusu forced two fantastic saves from Gabon goalkeeper Apaya Ngouegne. But there was nothing he could do about Owusu’s 3rd attempt. After a brilliant combination play with strike partner Osman Bukari, the latter slipped the ball to Owusu, who fired into the top corner to give Ibrahim Tanko’s side the lead. Ghana almost doubled their lead immediately after, but Joseph Painstil’s shot was straight at Ngouegne. On 24 minutes, center back Musah Nuhu found himself in good position in the opposition area and Benjamin Tetteh found him with a perfectly laid pass. However, the former WAFA defender miscued his effort much to the disbelief of the about 10,000 fans inside the Accra stadium. Gabon were almost level just before half time. Oyubi Grege broke down the left before squaring the ball to Shavy who met it first time but he saw his effort agonisingly brush the outside of the upright on its way out. Tanko brought on Bernard Tekpetey for Benjamin Tetteh after recess and the impact was instant as the Meteors their lead immediately after recess. Tekpetey connected beautifully from Painstil’s cross for 2-0, scoring with his first touch of the game. Tekpetey then shot wide after a scrambled corner kick fell in his way inside the Gabon area. After sustained pressure from Gabon, striker Osman Bukari made sure the result is resounding with an easy finish after winning possession in Gabon’s area before firing low past Nguoegne. As Gabon pushed for a vital away goal, Tanko replaced Joseph Painstil with Isaac Twum in an attempt to take control of a midfield that was now controlled by the Panthers. On 80th minute, Bukari scored again but perhaps Gabon would argue it was not fair play. After a drop-ball situation, Bukari was first to control the ball, and instead of giving the ball to the Gabonese, he sped off and fired a lot drove past the Gabon goalkeeper for 4-0. That was to be his last contribution of the game as he was replaced by Richard Danso. Kwabena Owusu then fired wide in added time but it didn’t matter as the Ghana take a 4-0 lead into the second leg on Tuesday. Success over the two legs will qualify the team for the third round of qualifiers where they will face the winner of the Equatorial Guinea-Algeria tie.